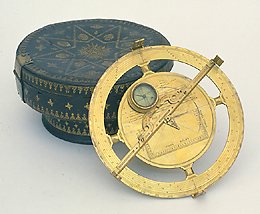 Surveying compass, simple theodolite, and graphometer are some of the names by which this type of instrument has been known. The instrument allowed the measurement of heights and distances and topographical surveys to be made. The engraving on this example is extremely fine and it is also provided with a leather case with gilded decorations. It was brought from Germany by Prince Mattias de' Medici. The instrument is signed by Erasmus Habermel, a maker of high-quality instruments destined for princely collections.